Spending three days in late October at RoboBusiness was nothing short of an intensive, mini-briefing on what’s ahead for robotics in 2014. Mentally invigorating is more like it. It was that good, especially with this my second go-round at the event: Pittsburgh in 2012 was superb; Santa Clara this year, even better. Nothing rivals this annual gathering for its triple shot of business insight, innovative technology and networking star power. Check out his recent blog: 13 Takeaways from Robobusiness 2013. Sam’s was the consensus opinion from what I could glean from attendees and speakers while strolling around the venue. A change is in the air, and RoboBusiness was delivering that message to all of us. Lots of bang for a measly $895! For a measly $895 early-bird conference pass?or less with special deals, some that included a free six months of Robotics Business Review?you could have begun a conversation on Wednesday afternoon of RoboBusiness and juggled it all the way through to Friday at dinnertime, with better than even odds that you could thread yourself through forty-plus speakers and keynoters, three dozen sessions, two half-day workshops, and a very walkable expo floor with sixty manufacturer displays. RoboBusiness was not overwhelmingly huge, like an Automatica, for example; yes, it was large?600-plus attendees?but still intimate enough where everyone was easily accessible from keynote headliners to industry heavyweights to just about anyone you took a fancy to chat to. Check out this very intriguing agenda: here. Good, eh? Presentations were loaded with great stats and perceptive thinking that collectively must have taken the speakers thousands of hours to prepare; better yet, prepared by people who are the best in the industry. On successive evenings, attendees were feted to two open-bar buffets that included an army of waiters cruising around with platters of warm appetizers; all the while one or many of the fifty Beam telepresence bots, courtesy of Suitable Technologies, sidled up to you with greetings and questions from Beam staffers. One of our writers, Emmet Cole, Beamed in from Austin, Texas, to chat with me and then to cruise the floor to meet others. Emmet’s test drive, consumer report article on his Beam experience will be forthcoming in our pages. He’s got an interesting take on the Beam user experience from a journalist’s point of view, as well as a few tips on best use for conducting interviews. Emmet has been talking with Suitable Technologies’ CEO, Scott Hassan for a forthcoming Robots & The Law story about some of the privacy issues surrounding remote presence devices. I got to interview a Mandarin speaker using an intermediary Beam as a translation aid. Of course, built-in simultaneous translation via voice or screen captions might have worked better. But hey, modifications are sure to come. For now, the big-screen, clear-audio and sleekly designed Beam gets excellent grades. Sandwiched in-between evening buffets were a pair of networking breakfasts advantageous enough to buttonhole speakers from the day before while reconnoitering those best-of-show sessions to attend next. The bottom line is that you got what you put in. At under $20 an hour for the three days, RoboBusiness 2013 was painless to the wallet, while being the perfect preparation for what’s on the near horizon in robotics for 2014. Six hundred attendees got their money’s worth, plus an earful of robotics from the industry’s best. If you weren’t there for Santa Clara and think that RoboBusiness 2014 next October in Boston is a bit too far off, consider RoboBusiness Europe 2014 (May 26-28, 2014), which will be held this spring in Denmark. Last year’s very successful debut of the European conference took place in Genoa, Italy. Chairing two all-day sessions there, I had a front row seat to the audience impact of the RoboBusiness conference concept of business and robotics, which was particularly new to the Continent, yet enthusiastically welcomed by the attendees. Many told me that most EU robotics’ meetings are much more formal or even academic in nature. See my American in Genoa series and RoboBusiness Goes Euro as the EU Readies its Robots for a look at the Italian debut conference that also offers up a sense of what’s on tap for Denmark. The afternoon opening of RoboBusiness in the Santa Clara Convention Center was one of contrasts: upstairs were four, one-hour sessions themed together under the banner of Agile Manufacturing; while spread out on the ground floor below loomed a world of kickstarters, robotics startups, funding prospectors and newbie entrepreneurs, appropriately called the Kickstart Workshop. Upstairs sat the establishment, speaking on topics of robots lowering operational costs, co-robots in manufacturing, and robots enhancing efficiencies or increasing product quality. Downstairs, robotics wunderkinden energized session conversations on building better robots; the journey from prototype to commercial product; how to master markets, and how best to dig out funding from VCs, investors and angels. By mid-afternoon, both floors had joined up and overflowed a ballroom while awaiting the much-anticipated RoboBusiness Pitchfire event, where fifteen startups were given three-minutes each to pitch themselves, their companies, their robots and their dreams to a panel of veteran industry investors. The Pitchfire was wild, audacious, filled with invention, innovation and fun. My colleague Casey Nobile, managing editor of Robotics Business Review, both managed and covered the happening. Get an eyeful of what transpired at her: Startups Take Center Stage at RoboBusiness Pitchfire. At the conclusion of the winner-take-all Pitchfire, won by Unbounded Robotics, the entire ballroom quickly emptied en masse and rushed the expo floor for the first of the aforementioned buffet fiestas?with open bar?as well as sixty manufacturer booths also open and waiting. Suitable Technology and its fleet of fifty Beams took up the entire front endcap of the large expo hall. Its president, Scott Hassan, together with lots of his troops, all sporting powder-blue shirts and let-me-get-to-know-you grins, mingled their machines and themselves with the wineglass-toting crowd of post-Pitchfire revelers. The resulting scene all evening long was lively, raucous, and one helluva interesting time. 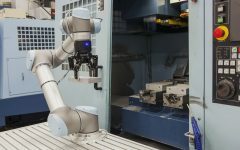 Putting robotics into context with a perspective toward industry, work and society for 2014 is a primary task for anyone ramping up to get a handle on the approaching technical and market opportunities. The first two hours of the morning keynotes at RoboBusiness were highlighted by presentations that did just that. These keynote sessions provided an excellent grounding in What are We? Where are We Going? and The Road Ahead for U.S. Robotics, from RoboBusiness co-chairman, Dan Kara, and Georgia Institute’s Henrik Christensen, respectively. These two keynotes together provided attendees with an important platform from which to decide upon and select subsequent breakout sessions for the following two days of the conference. Of the sixteen afternoon breakout sessions, I circled a six-pack that was a best-fit collection of sit-downs on what I considered key touch points from the morning keynotes. One half of my six-pack of selections dealt with vision and sensor systems, and fusing them together. A robot with sight is a better robot; an autonomous automobile with sight is, very obviously, a must as well. Spurred on by breakthroughs like Microsoft’s Kinect, vision sensors, or nearly every type of sensing device, for that matter, is in high demand. The technology segment is big and getting bigger in the marketplace and represents crucial technology to be very aware of for developers and investors alike. It was a banner year for vision systems in patent filings at the U.S. Patent Office, where such filings are leading indicators of the next big thing for 2014 and beyond. In fact, short term Machine Vision Market Will Reach $15.3 Billion by 2015. Steve Bentley’s Giving Robots the Gift of Sight; Wolfgang Juchmann’s Emerging Trends in Real-Time, 3D Vision for Robots; and Mike Stanley’s Sensor Fusion for System Wellbeing were right in my wheelhouse. Additionally, which is always a plus, the three briefings were brilliantly presented by well-spoken, brilliant people. With Jonathan Pale, director of emerging technologies at Hasbro, Inc., guiding the way, I felt that I had a ringside seat to what makes consumer markets for robots tick. Next up, number five on my list was attending Esben Ostergaard’s RobotsToppling Tradition: Making Robots Small, Cheap, Dexterous and Friendly. It’s something that Ostergaard knows a lot about, he’s done it. He co-founded Universal Robots and produced the tradition-toppling and very popular UR5. My sixth and final take-in of the sessions was Stanford University’s Anand Atreya, who helped me to Get Grounded in the Cloud: Real Talk about the Robotics Revolution. Yes, the Cloud, that all-embracing, do-everything high-tech mystery zone where robots can download anything into their noggins. “I can now,” she confidently replies, having just a nanosecond before Neo’s question downloaded and ingested the chopper’s operating instructions. Downloaded from where? Where else but the Cloud, the Hollywood version. Although not much in cloud computing has yet to settle into robotics, it soon will. Anand gave us a look-see at the Cloud’s future power over our robots. The AM keynotes were a pleasure in which to partake: the first three all had a consumer or workplace thread running through them, yet each was quite different in offering some very interesting perspectives about the world of robots that is actually here or incipient. Driverless cars was one, what Google calls “self-driving” cars; driverless sounds too out of control, I guess. Chris Urmson, Google’s director of self-driving cars, presented Where the Robot Meets the Road: Realizing Self-Driving Vehicles, which was an enjoyable first-person drive through his general experiences, unique challenges and successes of producing the car that Nevada now allows to zoom over its highways. Google has a cool video of a blind Steve Mahan behind the wheel of a Google car who takes a spin through a take-out line for tacos and then to his dry cleaner. Yoky Matsuoka, vice president of technology of Nest Labs, presented Robots and Thermostats: More in Common than You’d Think, which showed us the “robotedness” of common household items like her Nest thermostat. Although her briefing seemed more IT than robotics, the inevitable conclusion of it seemed to be that the imbuing of robot qualities into everyday objects will continue onward, putting forth the indisputable notion that someday soon much or all of our homes will be networked together into a single IT/robot machine system. Garry Mathiason, chairman of Littler, a national law firm dealing exclusively with employment law, purposely detoured us away from robotics and into the world of the coming workplace and the coming laws and regulations that we will need to be put in place to make the new world of humans and machines work in relative harmony. Three presentations stood out as essential from the afternoon’s slate of offerings: Robotiq’s Sam Bouchard in his Prepare for Manufacturing’s Tipping Point: Agile Industrial Robots. Bouchard directed himself to quick reaction and continuous change demanded by agile manufacturing and industrial robots as key enablers of that agility. Tully Foote from Open Source Robotics expounded on Marrying ROS to External Software. Foote addressed the ease of integrating ROS (Robot Operating System) with other software for quick and angst-free building of useful robotics systems. VectorNav’s Jeremy Davis reviewed the recent advances in MEMS sensing in his Inertial Sensing Solutions that Actually Work. Davis lead us into the world of recent advances in miniaturized mechanical and electro-mechanical devices or MEMS (Micro-Electro-Mechanical Systems) for stabilizing robots or mapping for obstacle avoidance, and fusing data with other sensors to enhance performance. The only area that I felt was a no-show at this year’s RoboBusiness was healthcare robotics. I saw one breakout session on the agenda, which was Sandy Agnos from Swisslog presenting Rx for Healthcare Robotics. Aside from her presentation, nada! RoboBusiness 2013 had a full healthcare track. RoboBusiness Europe 2014 will have a full healthcare track at its spring conference. That, including healthcare robotics emanating from Europe’s Horizon 2020 programs, makes the Danish event a real can’t-miss opportunity to hone in on healthcare robotics. Management sources hinted to me that Robobusiness 2014 will dial up more on healthcare robotics, which would be especially fitting these days with seemingly scads of new breakthroughs sprouting up almost daily from surgical to rehab to prosthetics; and, of course, in the growing size of the 65-and-over population that robotics mobility can impact mightily, plus the mammoth $2.5T annual health care costs in the U.S., which robotics can help to mitigate. Also, RoboBusiness 2014 will be a Cambridge/Boston venue, putting it smack into the heart of one of the world’s penultimate medical and pharmaceutical regions. The effect of holding RoboBusiness 2013 in Santa Clara/Silicon Valley can’t be underestimated: both attendees and sponsors alike cheered the site selection, hoping that the region will soon become a biennial?at the very least?RoboBusiness venue. Many in attendance were talking up the need for an annual visit.